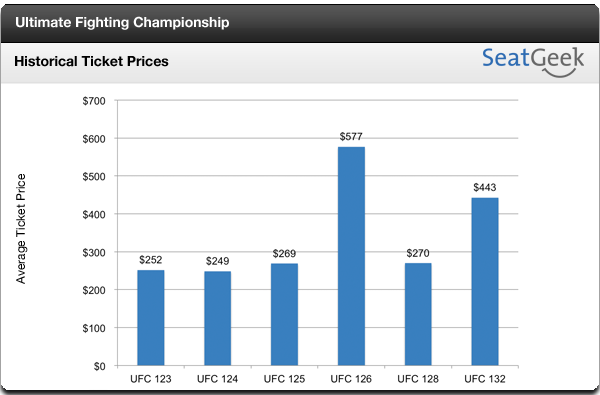 Get UFC 132 Tickets here at SeatGeek.com, the best ticket search engine. A bantamweight title fight has never headlined a UFC event, but Urijah Faber has the pedigree and the following to manage a decent draw in this fight. Faber, who faces champion Dominic Cruz in a rematch at UFC 132 in the night’s main event, carried the WEC’s lone attempt at a pay-per-view card last April when he fought current featherweight champion Jose Aldo. Despite my assurances, Dana White and Co. took no chances in putting together what has the potential to be the event of year, top to bottom. With fights like Wanderlei Silva vs. Chris Leben and Tito Ortiz vs. Ryan Bader rounding out the main card, UFC 132 could have an extremely successful pay-per-view buy rate. Find the best prices on UFC Tickets here at SeatGeek — and, as always, leave us your thoughts in the comment box below!